Radioactive waste from Europe's 143 nuclear reactors must in future be buried in secure bunkers, ministers from EU member states agreed on Tuesday (19 July). The new rules force national nuclear authorities to draw up disposal plans by 2015, which will be vetted by Europe's Energy Commissioner Guenther Oettinger. A statement by the EU Council of Ministers said that the plans would need to cover: the management of fuel and waste, licensing, control and inspections, enforcement, public information, consultation, financing and the establishment of independent regulatory authorities. 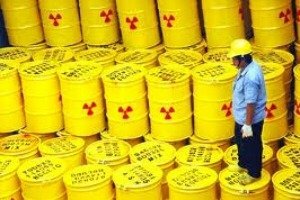 "After years of inaction, the EU for the very first time commits itself to a final disposal of nuclear waste," Oettinger said in a statement. The 14 member states using nuclear power currently store their radioactive waste in surface bunkers or warehouses for decades while it cools down. But crises such as Russia's wildfires last summer and leakage at Japan's stricken Fukushima plant have highlighted the risks posed by surface storage. Nuclear energy has not been popular in Europe since the 1986 Chernobyl disaster, but it is even less so since Fukushima, and Germany has even agreed to phase out nuclear power completely by 2022. Oettinger has made nuclear safety one of the main issues of his five-year tenure, pushing ministers to develop a pan-European safety strategy for the first time. The first step in that strategy is a series of 'stress tests' on nuclear plants, which started in June. The second is Tuesday's decision to dispose of spent nuclear fuel in secure repositories. Oettinger's team, which will vet the national strategies, has already stated its preference for 'deep geological repositories' – caverns to be built in clay or granite rocks between 100 and 700 metres underground. "National programmes have to include plans with a concrete timetable for the construction of disposal facilities," they said in a statement. Safety standards drawn up by the International Atomic Energy Agency will also become legally binding as part of the plan. Oettinger had initially proposed a total ban on exports of radioactive waste to other countries for reprocessing, but ministers created a loophole for future exports. Instead, waste can be shipped to countries that already have deep geological storage. "At present, such deep geological repositories do not exist anywhere in the world nor is a repository in construction outside of the EU," said Oettinger's team. "It takes currently a minimum of 40 years to develop and build one." But Greenpeace accused the Commission of adopting an "out of sight, out of mind approach" to radioactive waste that countries such as Hungary and Bulgaria could continue exporting to Russia. "All they are doing is dumping the long-term problem on someone else and putting Europeans at risk by allowing dangerous waste convoys," said Greenpeace's EU nuclear policy advisor, Jan Haverkamp. The EU's 143 nuclear plants produce about 50,000 cubic metres (1.77 million cu ft) of radioactive waste each year, says nuclear industry body Foratom. About 15% of that is high-level waste. Foratom, the trade group representing the European nuclear industry, welcomed the agreement on the directive, saying "it imposes legal responsibilities on member states to manage their radioactive waste and spent fuel safely without imposing unnecessary burdens on future generations". "Technically and economically viable solutions for the management of all categories of radioactive waste already exist. For the management of high-level waste and spent fuel (if the latter is considered as waste), the scientific consensus is that deep geological disposal represents the safest and most sustainable end-point. Some countries are already developing deep underground repositories. This directive should encourage others to make similar progress." Greenpeace, the environmental group, welcomed EU plans to address the problem of nuclear waste, especially in Bulgaria, Slovakia and Spain, which had so far been reluctant to put together comprehensive plans. However, it warned that the new rules on nuclear waste would open the door to dumping in Russia. "Despite pressure from the European Commission to block exports, the new rules will allow Hungary and Bulgaria, countries that currently have agreements for the export of nuclear waste to Russia, to continue transferring radioactive material," it said. Greenpeace EU nuclear policy adviser Jan Haverkamp said: "European governments have adopted an out of sight, out of mind approach to radioactive waste, but all they are doing is dumping the long-term problem on someone else and putting Europeans at risk by allowing dangerous waste convoys." Europe has a long history of cooperation in the peaceful use of nuclear in the framework of the Euratom treaty establishing the European Atomic Energy Community, which was signed in 1957. Euratom was originally created to coordinate member states' research programmes for peaceful use of nuclear energy and to establish safety standards. In 2002, the European Commission tabled a nuclear package, including directives on nuclear safety and radioactive waste. But the legislation ran into strong resistance from a blocking minority, which included Germany. In June 2009, the EU adopted a revised Nuclear Safety Directive, which made nuclear safety standards established by the International Atomic Energy Agency (IAEA) legally binding. In March the same year, European Commission President José Manuel Barroso announced that the EU executive would table legislative proposals on the treatment of nuclear waste by the end of the year. August 2011: New directive enters into force. August 2013: Deadline for member states to comply with directive. By 2015: EU countries to detail their plans for storing or reprocessing radioactive waste. Doesn’t sound like there was any serious work done on this issue – just kowtowing to the nuclear lobby. We expect more from European officials but unfortunately that is all we get – mediocrity. Thank God! Someone with brains spkaes! I’m so glad that the ientrnet allows free info like this!